This is topic Bell & Howel 256 Spindle Arms putting back together Help in forum 8mm Forum at 8mm Forum. Howdy all, trust all are well. 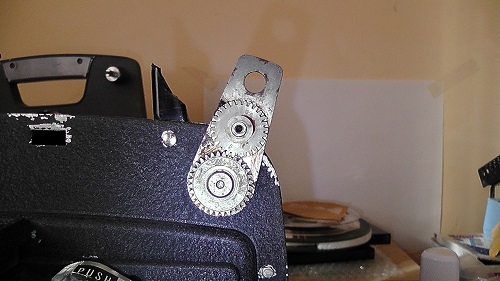 I had to replace the spindles on my Bell & Howell 256, thanks to guy in USA on EBay who sells them from Tobin Cinema I think some on here know him or of him, (Great E-Bayer, he included very detailed instructions on how to put spindles on and how to calibrate them), why they had a plastic screws as original, sheesh, I was wondering why reel that had bulk of film on it, was wobbling. I tried to tighten plastic screws on original ones and of course they broke being so old. 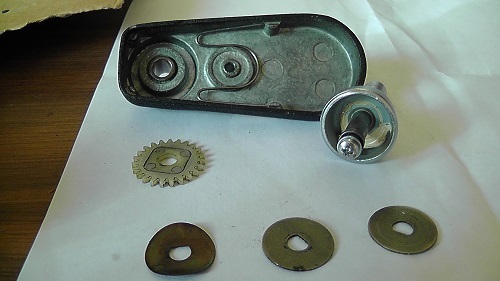 Anyway one issue, my brother by mistake ( he thought he was doing right thing) took spindle arm covers off, now I am trying to work out how the top sprocket cog wheel and the two washers and what I believe is called a Wave Washer go back on. I can get them back on and spindle and cover without the wave washer, but no good of course as wave washer required. Anyone had to do this on a B& H 256 or similar? Hopefully someone has suggestion, Thanks again for support. I have had these replaced the nylon screws have a torque setting yours broke because you may have put to much tension on them. Only had projector a little while and reel sizes I have played are only 200feet, no idea of course what previous owner played on it. Have you ever had to take of reel arms covers? Only the covers to see how they worked but never the spindles I had a repair shop do that. In case others ever need to know, I worked it out. On each spindle doesn't matter which order the washers go including the wave one ( the bent looking one) I put the cog wheel after one washer so it aligns with other cog wheels on arms. Then put spindle into arm and put space and then screw and washer to tighten up other side and then calibate it. Just make sure spacer is lined up okay before you really tighten scerws. Phil where did you get replacement screws?